Head of Russian Orthodox Church, Patriarch Kirill has warned that the usage of smartphones is paving way for the Antichrist. 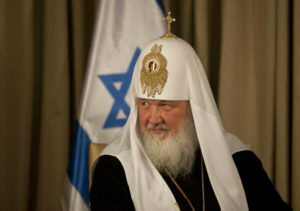 Patriarch Kirill said the Church does not oppose technological advancements but the internet-connected devices creates the possibility for “universal control over humanity”. The “devil acts very wisely” in offering people such a “toy”, he said. During an interview on Russian state television, he said the gadgets allow someone to know “exactly where you are, know exactly what you are interested in, know exactly what you are afraid of”. Could smartphones really be a tool of the Antichrist? He continued: “Such control from one place forebodes the coming of the Antichrist. “The Antichrist is the person that will be at the head of the world wide web controlling all of humanity. That means that the structure itself poses a danger. The patriarch maintained he wasn’t categorically against gadgets, but warned that people should be careful not to “fall into slavery to what’s in your hands”. Christians tend to regard the Antichrist as the polar opposite and personal opponent of Christ. His coming is counted among signs pointing to the end of the world. Biblical warnings concerning the Antichrist are found in several books of the Bible including 1 John. This entry was posted in Belief, Bible Reading, Christianity, Faith, News and tagged Antichrist, Bible, Bible Teaches, Church. Bookmark the permalink.